You know I'm always out on the hunt for pianists who can come close to caliber of my favourites, Jason Moran or Kris Davis. It's very hard to find that kind of forward thinking talent. But recently I stumbled across some great work from Englishmen turned New Yorker, John Escreet. 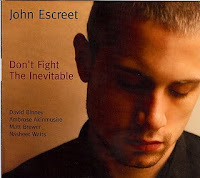 Escrett's new album Don't Fight The Inevitable is a sublime piece of compositional thinking that will leave listeners staggering around trying to figure out what just hit them. That would be a might dose of creativity! Escreet has only been around for a few years but has quickly made a name for himself stateside in that short time. Originally a member of the British outfit Empirical, John Escreet left the band prior to their first record and moved to New York to study at the Manhattan School of Music. In addition to his studies he also did a number guest musician spots. But it has been his studying and association with the great Jason Moran and Kenny Barron that seems to have had lasting impact on his compositional work. His debut recording, Consequences (Posi-Tone Records; 2008) was an astounding piece of work with mainly original material. The epic opener "The Suite Of Consequence" is reason along for any jazz fan to stand up and take notice. Don't Fight The Inevitable is a whole step above. Where Consequences was a brilliant intersection of avant garde and post bop craftsmanship, Don't Fight The Inevitable is the work of a musician thinking far beyond the boundaries of the aforementioned sub-genres. His band consisting of David Binney, Ambrose Akinmusire, Matt Brewer and Nasheet Waits utilize some stellar abstract changes and phrasing, especially on "Civilization On Trial" and the title track, which illustrates Escreet has learned a lot from his mentor, Moran over the last few years. But don't be fooled into thinking that Escreet is a clone of Jason Moran. 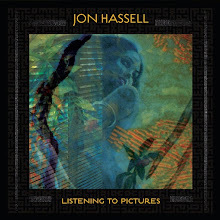 Escreet has quickly developed his own voice that resonates throughout the lengthy eight tracks on this sophomore effort. "Magic Chemical (For The Future)" is the perfect example of how Escreet can switch gears from the more complex free form work to a more post bop midtempo number with lovely exchanges between Waits, Binney and Escreet. It's beautiful, powerful, arresting and challenging all rolled into twelve minutes. With "Trouble And Activity", Escreet has carved a wonderful piece in which Akinmusire stands high with some arching solos. Escreet's performance is sharp and crisp with real muscle and maturity beyond his 25 years. Another balladry moment is captured in the short but lovely "Gone But Not Forgotten"--a touching number that his mainly Escreet and Binney in duo form. The album closes on the multi-layered and visceral tone of "Avaricious World" which seems to build and collapse upon itself with various sonic moments. The quintet really move through various patterns and soundscapes on this piece. It sort of encompasses the entire ethos of the album--post modern but circling the outskirts post bop. Don't Fight The Inevitable is a post modern classic from a young talent that has become an established and revered composer on the scene very quickly. It's challenging music but I think John Escreet should be on JazzWrap readers list of artist to check out sooner rather than later.